Because each of our children are unique, individual human beings, they're each good at different things- including chores. Caedmon is my go-to mopper, as he's thorough and careful to scrub when needed, something that his two older siblings can't (WON'T) seem to grasp. Plus his dimple comes out when he's putting some muscle into the job. If that isn't added incentive to give him this particular task, I don't know what is. Atticus, on the other hand, is the kid I call upon when I have a mountain of towels to fold. It's not his favorite chore, but I tell him that not everyone can be a master of the tri-fold. He is very comforted by this. He's also my head snow shoveler. I took this picture on Christmas Eve, after we'd been to church and he'd had to sit still and listen to adults for close to an hour. As soon as we got home, he begged to go out and shovel, as he had energy to burn. This had the added benefit of making me look like a monster to our neighbors, sending our seven-year-old boy out into the cold to do manual labor on the night before Christmas, all while I watched in my fancy holiday clothes from within the comfortable warmth of our house. I thought about making a big sign to hold up to the window: "HE ASKED FOR IT," but I decided there was a faint possibility that could be misconstrued. Only kidding. I don't much care for iced tea. Is this or is this not the most perfect coffee receptacle you've ever seen? 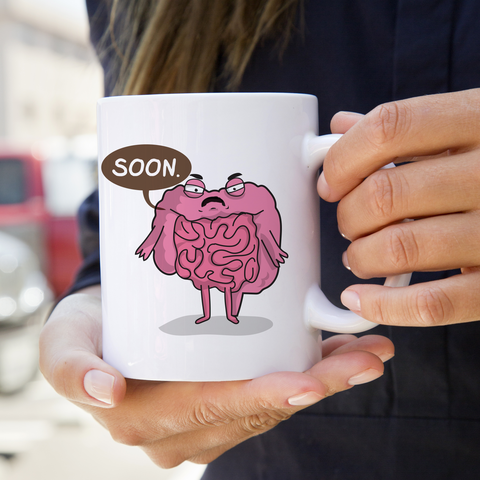 It's from The Awkward Yeti, and let me tell you, if you've ever felt like the only thing missing in your life is a hilarious comic featuring cartoon internal organs, then get ready to achieve nirvana. I follow him on Instagram, because I am not a fool and I never underestimate the effect of a well-executed gall bladder joke. And finally, despite all my attempts at visualizing a vomit-free weekend, last night was... well, let's just say it was decidedly malodorous. As of now, this illness has felled 60% of the residents of this household, and although I'm hoping Derek and I will emerge unscathed, given the amount of times my person has waded through a quagmire of germ juice over the past few days, it's not looking good. So far, though, it only seems to be a 24-hour bug, where it hits its victims with uncalled-for violence, but then more or less leaves them alone to sleep it off and emerge more or less back to normal. This morning Adelaide and Caedmon were making up for hours of action last night. These still count as joyful sights to behold, as the visage of our sleeping children makes my twisted little heart glow on any day, but when they've been sick? Those sleeping babes make me whisper-yell, "HALLELUJER!" (so as not to wake them, see), because that means it's finally break time, and by "break time" I mean time to wash every piece of bedding or clothing you can sneak out of their rooms without waking them, lighting candles in every room, and opening any and all bedroom windows, because the outside temp may be below freezing, but at this point, fresh is fresh air, man. Please note that she surrounded herself with all the things that comfort her: A bag full of library books, a coloring book and pens, and there under her head you can just make out the little pink pillow I made for her to take to kindergarten. So! What sights fill your heart with joy these days? Do, do share, as I could use a few extra merry sights during this bleak, colorless time of year. What filled my heart with JOY on Friday night was pulling into the driveway and seeing my daughter there shoveling the driveway for us, after receiving a phone call from me saying, "We are on our way home in a blinding snowstorm! Go out and shovel the driveway now!" and her saying, "But it's dark outside," following which I hung up in disgust. But she did it! I was also joyful at my amazing good luck to have arranged my connecting flights through Atlanta on Wednesday and Thursday and NOT on Friday or Saturday. Yay! I am glad you made me think about joy, because, yes, a lot of things seem so very bleak right now. That's what I get for reading a book about Afghanistan at this time of year. I should know better!